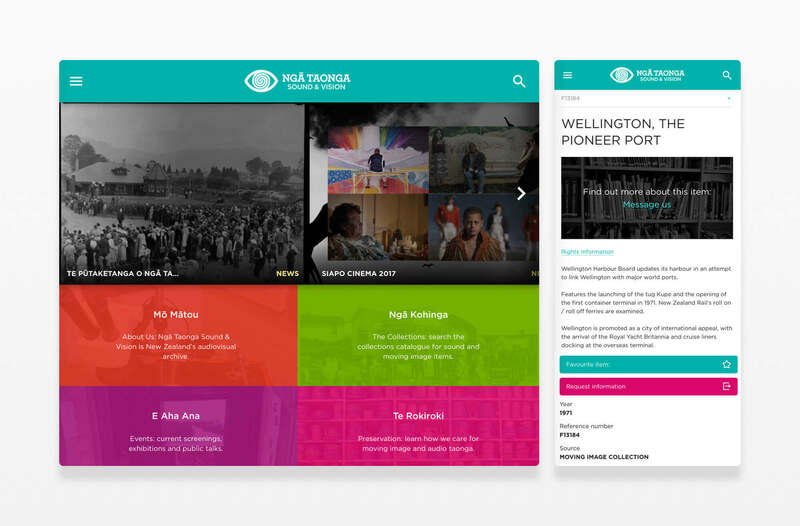 Ngā Taonga Sound & Vision came to us to develop their corporate site after the success we’d achieved with their award-winning website Anzac Sights & Sounds. Ngā Taonga Sound & Vision is New Zealand’s moving image and sound archive, formed when the Film Archive, Radio NZ and TVNZ archives merged. Their budget was tight but much needed to be achieved: unify three disparate collections, convey the authority of a corporate site while appealing to a younger audience, and implement a new Content Management System. Our solution? An Agile project and open source tools. Ngā Taonga aims to collect, share and care for New Zealand’s audiovisual taonga. They wanted to make it easy for all New Zealanders to find and use their combined collections. Leveraging our expertise in solving complex digital asset management problems, we used the open source Supplejack tool we had developed. This pulled together the 270,000 collection items into a single, searchable online catalogue that lets users collect, share and research the resources. To limit costs we re-skinned the out-of-the-box Supplejack search website, implementing a responsive design that features a vibrant, image-rich look and feel, immersive video and audio, and easy social sharing. To speed up the build we used Refinery, an open source Ruby on Rails CMS. Collaboration is at the heart of our Agile approach. We worked with Ngā Taonga from the outset, using creative activities to help them form their project vision. Ngā Taonga Product Owner Diane Pivac became part of the project team, coming into Boost for each stand up. We were able to deliver more value and less risk by prioritising Diane’s requirements and delivering them in stages.